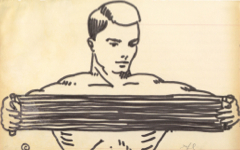 Roy Lichtenstein's early drawings in a Pop mode have fairly obvious references to art itself. He made this large drawing, for example, from a tiny clipping found inside his studio, the exact purpose of which is unclear. Lichtenstein, Mail-Order Foot (1961) Pochoir, pen and ink on paper. The Sonnabend Collection. 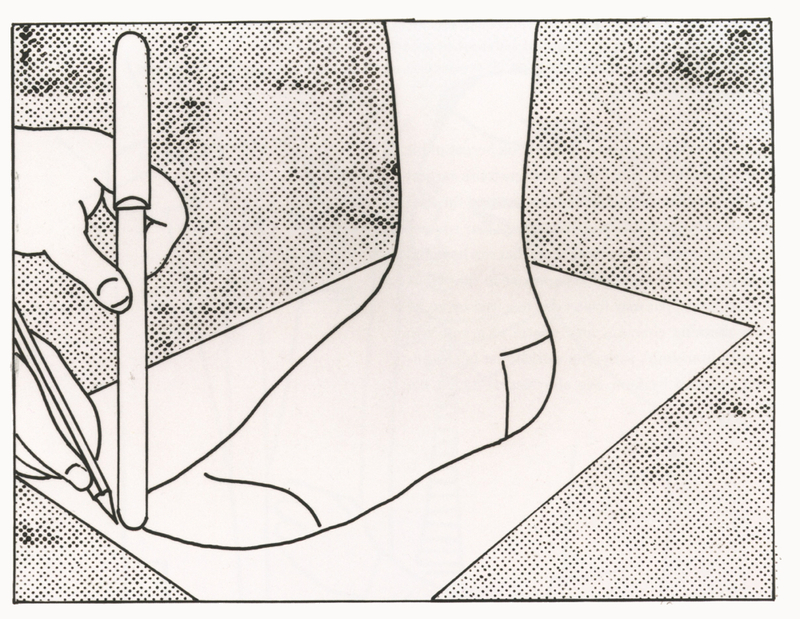 The source shows a foot being traced on a piece of paper using a pencil and knife with instructions on how to do it underneath. 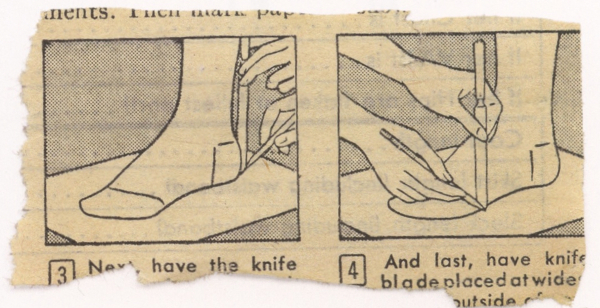 Untitled loose clipping found in Roy Lichtenstein's studio. Source unidentified. The Roy Lichtenstein Foundation Archives. 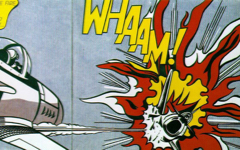 With experience Lichtenstein's references to art became more subtle. In a related drawing, Foot Medication made the next year, much remains the same even if its link to art becomes less obvious...and, thus, more poetic. 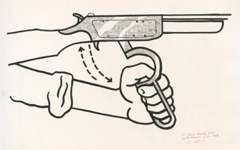 For an analysys of Lichtenstein's Foot Medication (1962), click here. 3. Knives, swords, daggers and other sharp instruments are common visual metaphors in art not only for a pencil but for paintbrushes, palette-knives and burins as well, even a sculptor's chisel. Dozens of examples by numerous great artists are included in the theme Swords/Weapons as Brushes. 4. As I regularly explain artists have always depicted scenes inside their minds even when they were labelled as Realists or Impressionists. From at least the early Renaissance onwards the scenes in great art depict in metaphorical form the visual and artistic processes at work in the mind of the artist. Original Publication Date on EPPH: 04 Mar 2013. © Simon Abrahams. Articles on this site are the copyright of Simon Abrahams. To use copyrighted material in print or other media for purposes beyond 'fair use', you must obtain permission from the copyright owner. Websites may link to this page without permission (please do) but may not reproduce the material on their own site without crediting Simon Abrahams and EPPH.